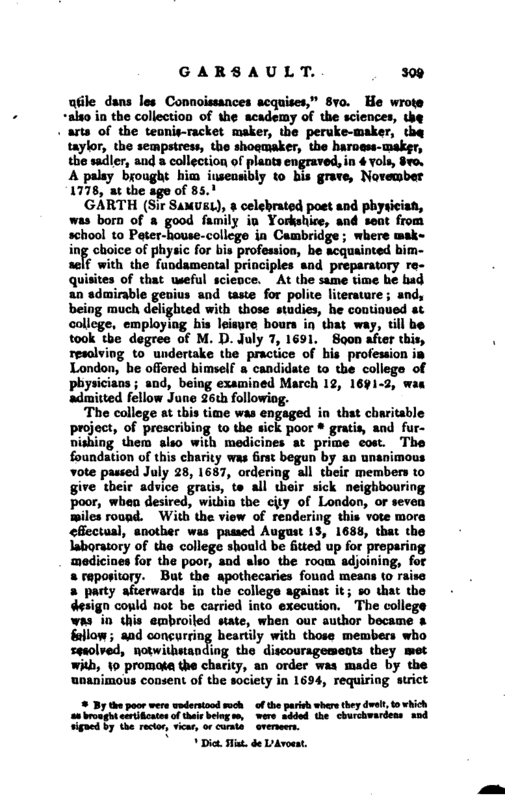 , a celebrated poet and physician, was born of a good family in Yorkshire, and sent from school to Peter-house-college in Cambridge; where making choice of physic for his profession, he acquainted himself with the fundamental principles and preparatory requisites of that useful science. At the same time he had an admirable genius and taste for polite literature; and, being much delighted with those studies, he continued at college, employing his leisure hours in that way, till he took the degree of M. D. July 7, 1691. Soon after this, resolving to undertake the practice of his profession in London, he offered himself a candidate to the college of physicians; and, being examined March 12, 1631-2, was admitted fellow June 26th following. By the poor were understood such as brought certificates of their being so, signed by the rector, vicar, or curate of the parish where they dwelt, to which were added the churchwardens and overseers. | obedience from til their members to the order of 1688. This new order was presented to the City on June 18, 169,:, for their assistance but this too being defeated by the dissolution of the common- council at the end of the year, a proposition was made to the college, Dec. 22, 1696, for a subscription by the fellows, candidates, and licentiates, for carrying on the charity, by preparing medicines in a proper dispensatory for that purpose. In the same year, Dr f Garth, detesting the behaviour of the apothecaries, as well as of some members of the faculty in this affair, resolved to expose them, which he accordingly executed, with peculiar spirit and vivacity, in his admirable poem entitled “The Dispensary.” The first edition came out in 1699, and it went through three impressions in a few months. This extraordinary encouragement induced him to make several improvements in it; and, in 1706, he published the sixth edition, with several descriptions and episodes never before printed *. In 16y? he spoke the annual speech in Latin before the college, on St. Luke’s day; which being soon after published, left it doubtful, whether the poet or the orator was most to be admired. In his poem he exposed, in good satire, the false and mean-spirited brethren of the faculty. In the oration, he ridiculed the multifarious classes of the quacks, with spirit, and not without humour. Pope observed that the Dispensary had been corrected in every edition, and that every change was an improvement. Dr. Johnson, however, adds, not without reason, that it still wants something of poetical ardour; and being no longer supported by accidental and extrinsic popularity, has scarcely been able to support itself. | expence of a funeral, pronounced a suitable oration over the remains of the great poet, and afterwards attended the solemnity from Warwick-lane to Westminster-abbey. 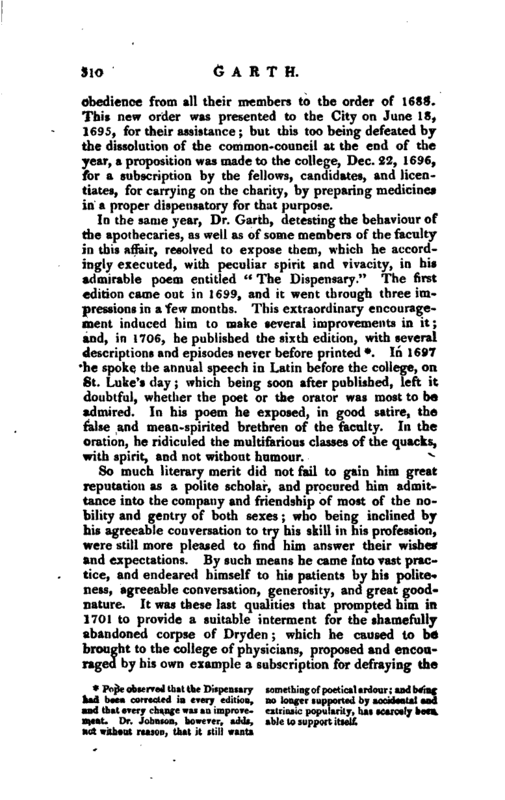 It is commonly observed, that the making of a man’s fortune is’generally owing to some one lucky incident; and nothing was perhaps of more service in that respect to Dr. Garth, than the opportunity he had of shewing his true character by this memorable act of generosity. In his Harveian speech he had stepped a little aside from the principal subject, to introduce a panegyric on king William, and to record the blessings of the revolution. The address is warm and glowing; and to shew that his hand and heart went together, he entered with the first members who formed the famous Kit-Kat club, which consisted of above thirty noblemen and gentlemen, and was erected in 1702, purely with the design of distinguishing themselves by an active zeal for the protestant succession in the house of Hanover *. 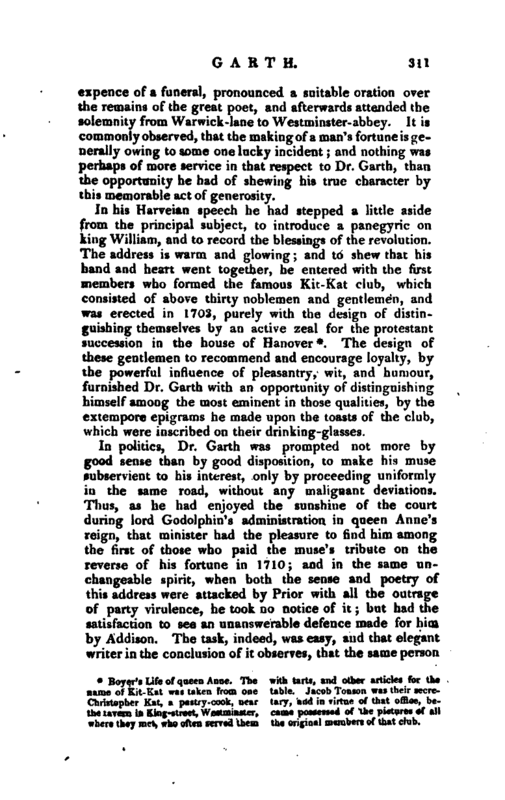 The design of these gentlemen to recommend and encourage loyalty,* by the powerful influence of pleasantry, wit, and humour, furnished Dr. Garth with an opportunity of distinguishing himself among the most eminent in those qualities, by the extempore epigrams he made upon the toasts of the club, which were inscribed on their drinking-glasses. Boyer’s Life of queen Anne. The name of Kit-Kat was taken from Christopher Kat, a pastry-cook, near the tavern in King-street, Westminster, where they met, who often served them with tarts, and other articles for the one table. Jacob Tonson was their secretary, and in virtue of that offioe, became possessed of the pictures of all the original members of that club. | who has endeavoured to prove that he who wrote the “Dispensary” was no poet, will very suddenly undertake to shew that he who gained the battle of Blenheim, was no general. There was, indeed, no need of a prophetic spirit to inspire the prediction. It was written in Sept. 1710; and the following year, in December, the duke of Marlborough was removed from all his places, and having obtained leave to go abroad, embarked at Dover for Ostend, Nov. 30, 1712. Dr. Garth had lived in the particular favour and esteem of this great man while in power, and when he was out of power he lamented in elegant verse, his disgrace and voluntary exile. In the mean time, with the same feelings, he had written a dedication for an intended edition of Lucretius, in 1711, to his late majesty king George I. then elector of Brunswick; and on the accession of that prince to the throne, had the honour of being knighted with the duke of Marlborough’s sword, was appointed king’s physician in ordinary, and physician general to the army. These were no more than just rewards even of his medical merit. 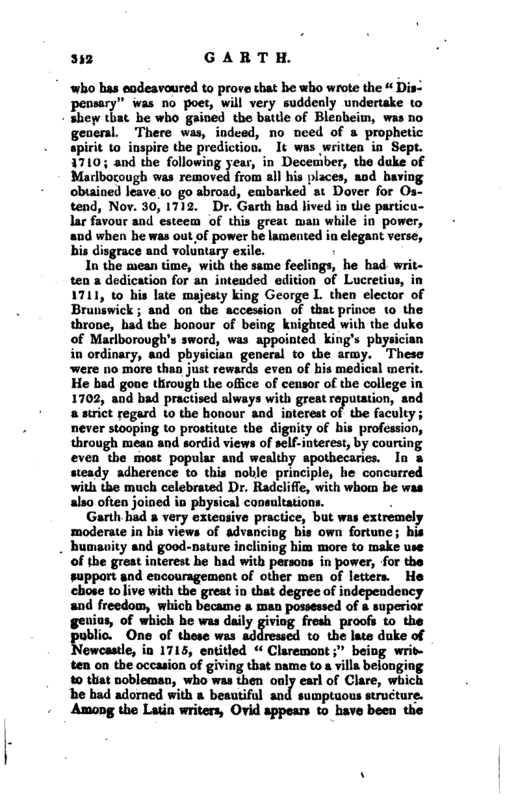 He had gone through the office of censor of the college in 1702, and had practised always with great reputation, and a strict regard to the honour and interest of the faculty; never stooping to prostitute the dignity of his profession, through mean and sordid views of self-interest, by courting even the most popular and wealthy apothecaries. In a steady adherence to this noble principle, he concurred with the much celebrated Dr. Radcliflfe, with whom he was also often joined in physical consultations. Garth had a very extensive practice, but was extremely moderate in his views of advancing his own fortune; hi humanity and good-nature inclining him more to make use of the great interest he had with persons in power, for the support and encouragement of other men of letters. He chose to live with the great in that degree of independency and freedom, which became a man possessed of a superior genius, of which he was daily giving fresh proofs to the public. One of these was addressed to the late duke or Newcastle, in 1715, entitled “Claremont;” being written on the occasion of giving that name to a villa belonging to that nobleman, who was then only earl of Clare, which he had adorned with a beautiful and sumptuous structure. Among the Latin writers, Ovid appears to have been the | doctor’s favourite; and it has been thought that there was some resemblance in their dispositions, manners, and poetry. One of his last performances, was an edition of Ovid’s Metamorphoses, translated by various hands, in which he rendered the whole 14th book, and the story of Cippus in the 15th. It was published in 1717, and he prefixed a preface, wherein he not only gives an idea of the work, and points out its principal beauties, but shews the uses of the poem, and how it may be read to most advantage. The distemper which seized him the ensuing year, and ended not but with his life, caused a general concern, and was particularly testified by lord Lansdown, a brother poet, though of a different party, in a copy of verses written on the occasion. He died after a short illness, which he bore with great patience, January 18, 1718-19. His loss was lamented by Pope, in a letter to a friend, as follows: “The best-natured of men,” says this muchadmired poet, “Sir Samuel Garth, has left me in the truest concern for his loss. His death was very heroical, and yet unaffected enough to have made a saint or a philosopher famous. But ill tongues and worse hearts have branded even his last moments, as wrongfully as they did his life, with irreligipn. You must have heard many tales on this subject; but if ever there was a good Christian, without knowing himself to be so, it was Dr. Garth.” This, however, is nothing against positive evidence, that Dr. Garth was a free-thinker, and a sensualist; and the latter part of it, his being a good Christian without knowing himself to be so, if it be not nonsense, is a proof that Pope cannot deny what he is angry to hear, and loth to confess. 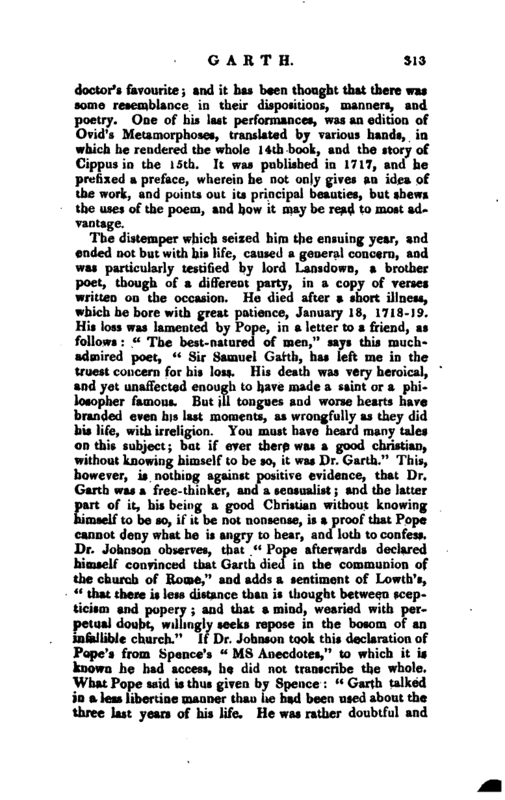 Dr. Johnson observes, that “Pope afterwards declared himself convinced that Garth died in the communion of the church of Rome,” and adds a sentiment of Lowth’s, “that there is less distance than is thought between scepticism and popery and that a mind, wearied with perpetual doubt, willingly seeks repose in the bosom of an infallible church.” If Dr. Johnson took this declaration of Pope’s from Spence’s “ms Anecdotes,” to which it is known he had access, he did not transcribe the whole. What Pope said is thus given by Spence: “Garth talked in a less libertine manner than he had been used about the three last years of his life. He was rather doubtful and | fearful than irreligious. It was usual for him to say, that if there was any such thing as religion, it was among the Roman catholics. He died a papist, (as I was assured by Mr. Blount, who called the father to him in his last moments) probably from the greater efficacy, in which we give the sacraments. 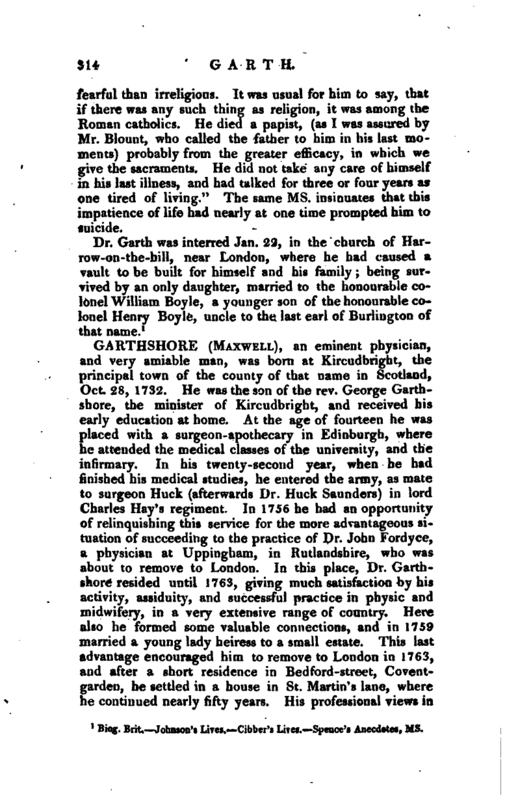 He did not take any care of himself in his last illness, and had talked for three or four years as one tired of living.” The same ms. insinuate* that this impatience of life had nearly at one time prompted him to suicide. 1 Biog. Brit, Johnson’s Lives. Gibber’s Lives. Spence’s Anecdotes, ms.